A Speech-Language Pathologist (SLP) specializes in communication disorders. An SLP must hold a master’s degree to practice speech-language pathology. 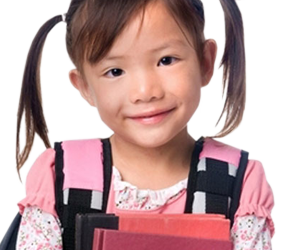 They evaluate and treat speech delays/disorders, language delays/disorders, and have a growing role in literacy. An SLP helps people learn to communicate, to say words clearly, and to understand and use language. SLP’s can provide services in schools, hospitals, rehabilitation settings, and private clinics. The language that a person understands. The language skills that a person is able to use. The use of language is social situations, social skills. How a person hears what is being said. The pronunciation of sounds in words. A person’s ability to produce various sequences of sounds while speaking. Refers to the flow of speech or stuttering. When should I be concerned about my child’s language development? Refer to our developmental charts. Children develop at different rates. You should trust your parental instincts and have your child evaluated by a speech-language pathologist if you have concerns. *Early intervention is crucial. The earlier a problem is detected and treated, the greater chance your child has for success in achieving their fullest potential. When should I be concerned about my child’s speech errors? Between the ages of 3 – 4 years your child should be at least 80% intelligible to strangers. If family members and/or friends are having difficulty understanding your child you should have them evaluated by a speech-language pathologist. The most difficult sound to remediate is the ‘r.’ If your child is still having difficulty with this sound by age 6, you should speak with a speech-language pathologist. My toddler/preschooler is stuttering, should I be concerned? Some children go through a normal period of dysfluent speech. This generally consists of whole word and phrase repetitions. If the dysfluent speech lasts longer than 3 months or worsens, meaning the child is repeating individual sounds, prolonging individual sounds, or getting “stuck” while talking, speak with a speech-language pathologist right away. You should also speak with a speech-language pathologist if your child is showing any signs of tension, loss of eye contact, or extra body or face movements while stuttering. I think my child needs speech and/or language therapy, but the school says that he/she does not qualify. What do I do? Public schools are required to follow state eligibility criteria when determining an educational diagnosis. For an educational diagnosis of “Sound System Disorder”, the child must exhibit errors considered by the state to not be appropriate for his/her age. Just because the state considers your child’s speech errors to be appropriate, does not mean that they would not benefit from speech therapy. If the sound errors are affecting them in school, making them unintelligible to other people, or embarrassing your child seek out a private speech-language pathologist. *Remember early intervention is crucial! In order to meet eligibility criteria for a Language Impairment and receive language therapy, your child must show a 22 point split between their cognitive ability (i.e. IQ) and their language skills. Again, if your child is struggling to understand and/or use language, or is having difficulty in class and does not meet these state criteria, it does not mean that they will not benefit from language therapy. Anytime a child has below average language skills they can benefit from language therapy. Actually, a little language therapy may really help them to be successful! If you are still concerned contact a speech-language pathologist to discuss your individual child’s needs. Do you accept private insurance or Medicaid? No. We do not currently bill insurance companies. However, we will provide an invoice which you can submit to your insurance company for reimbursement. We do not bill Medicaid.